Dave Bachrach is an expedition guide specializing in coastal brown bears, photographer and conservationist leading wildlife tours to remote destinations in Alaska. Since founding AK Adventures in 2003, Dave is now recognized as one of the top brown bear photography guides working today. His personal style could be best summed up as confident, calm and unpretentious with both clients and wildlife. 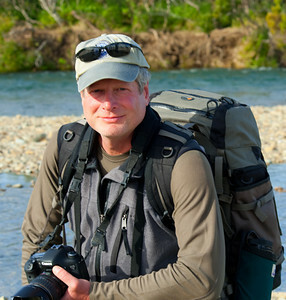 Using his extensive knowledge of bear behavior and photography experience gained over many years and thousands of hours in the field, enables Dave to help clients be in the right place, at the right time and ready to capture the images they are looking to take home. Dave’s photography have been featured by the National Park Service, Bureau of Land Management, National Parks Conservation Association, Defenders of Wildlife, in numerous publications, presentations and exhibits. He has also worked in film production such as guiding for the BBC Natural History Unit. Dave is a member of the North American Nature Photographers Association (NANPA) and the International Association for Bear Research and Management (IBA). Dave hopes that his tours will not only allow clients to go home with fantastic images, but will also inspire them to use their experiences and photographs to help further conservation and environmental stewardship around the globe. His personal commitment to conservation is unwavering as he works with legislators, government agencies and non-profit organizations to help educate the public and pass legislation to protect and maintain healthy bear populations in their natural habitats. While brown bears are hibernating, Dave’s either out photographing spectacular northern lights displays, endangered polar bears, and sled dog races, or is at home in Homer where photographing wildlife, amazing vistas and experiencing the adventure of living in Alaska is as easy as opening the front door. For more information about Dave's bear and wildlife photography tours go to the AK Adventures website.